LAS VEGAS, NV--(Marketwire - January 6, 2011) - CES 2011 - ViewSonic Corp. (South Hall 30873), a leading global provider of computing, consumer electronics and communications solutions, is bringing its commitment to quality and value to 3D digital photography with the debut of its ViewFun 3D line at CES 2011. "Our new ViewFun 3D line encompasses the meaning of digital entertainment, enabling consumers to create and enjoy the possibilities of traditional 2D and 3D content," said Jeff Volpe, vice president and general manager for ViewSonic Americas. "These new offerings put content creation and enjoyment in the hands of our customers, enabling them to take ViewSonic anywhere they wish to remember and share." Today, the ViewFun 3D line includes a total of five new media devices that enable consumers to create and connect to 3D and 2D content wherever they are. 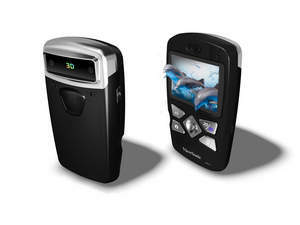 From simple point and shoot 3D to 1080p HD video, the ViewFun 3D line brings portable 3D entertainment to new heights. With integrated editing software, USB recharging, high-quality optics, glasses-less and autostereo viewscreens, consumers are equipped for 3D fun everywhere they go. ViewFun 3D products include the Snap pocket 3D digital camera, the PocketHD, Pocket and Palm 3D HD camcorders, as well as the Show 3D multimedia photo frame. 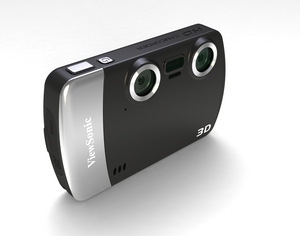 The ViewFun 3D Snap is a pocket-sized digital camera that captures 2D and 3D images and video. With the Snap's dual 5-megapixel lens, consumers can enjoy an instant 3D experience with an intuitive user interface that makes it easy to capture and display their memories. For ultimate images, the Snap supports a camera resolution of up to 12-megapixels to get users right into the action. Enjoy instant 3D playback on a 2.4" 3D LCD panel without wearing glasses as a result of advanced parallax barrier technology. Consumers can also play back captured content on a regular 2D PC or notebook by selecting the red/cyan format and wearing the Snap's included red/cyan glasses. Or use the mini HDMI port to view images and videos in side-by-side format on most 3D HDTV solutions. Additionally, the Snap's built-in software makes it easy to share content on Facebook and YouTube 3D. Paired with a rechargeable Li-ion battery and flexible SD/SDHC storage slot options, the Snap is the ideal 3D camera for everyday use. The ViewFun 3D Snap will be available in Q1 2011 for an ESP of $149.99. The ViewFun 3D Pocket and PocketHD Camcorders enable consumers to capture 3D or 2D HD videos in Full HD 1080p on the ViewFun 3D PocketHD and HD 720p on the ViewFun 3D Pocket. 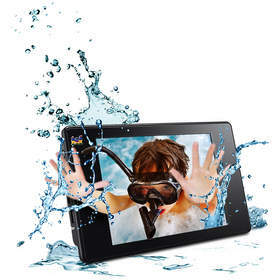 Enjoy instant live 3D playback on the 2.4" LCD panel without glasses, using parallax barrier technology. Then play back content instantly on a standard PC or notebook by wearing the included red/cyan glasses. Or, use the mini HDMI port to view images and videos in side-by-side format on most 3D HDTV solutions. Additionally, consumers can enjoy 3D content on PC monitors with the NVIDIA™ 3D Vision Kit and on 3D HDTVs with their specific shutter glasses(1). With these dual 5-megapixel fixed focus cameras, consumers can capture 3D still images as well as 3D HD video. Intuitive built-in software is designed for easy uploading and one click video sharing on YouTube 3D and Facebook. A USB rechargeable Li-ion battery and flexible SD/MMC storage slot options make content creation simple when on the move. 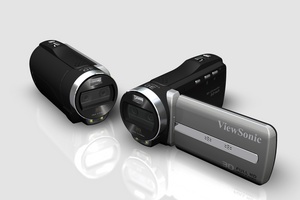 The ViewFun 3D Pocket camcorder is currently available for an ESP of $179.99. The ViewFun 3D PocketHD will be available in early Q2 2011 for an ESP of $199.99. A super compact Full HD 1080p 3D and 2D capable camcorder, the ViewFun 3D Palm records special moments without weighing users down. Perfect for video enthusiasts, the Palm records HD video at a rate of 60 frames per second (fps) to capture fast moving objects without delays or distortion. Additionally, the Palm features an auto/on/off flash light for pictures, dual LED lights for video, a night shot auto off mode, a built-in stereo microphone and speaker, and white balance correction settings (auto, sunny, cloudy, fluorescent and Tungsten) to ensure every memory is saved as the user experienced it first-hand. Like the PocketHD and Pocket camcorders, the Palm offers instant 3D playback on its 3.2" LCD panel without glasses, content play back on a PC or notebook with included red/cyan glasses, or 3D HDTV viewing via the mini HDMI port, as well as easy YouTube 3D and Facebook video sharing. This device also includes a rechargeable Li-ion battery and flexible SD/SDHC storage slot options, and will be available in early Q2 2011 for an ESP of $249.99. The ViewFun 3D Show makes it easy to share life's memories with the excitement of 3D. Not only does this device flawlessly display 3D photos and videos with no glasses needed, it also automatically converts standard 2D photos and videos to 3D. In addition to customized slideshows with music, this multifaceted device offers all the functionality of a cutting-edge digital frame, such as calendar, clock and alarm features. Additionally, a rechargeable built-in battery and hidden touch panel controls ensure the ViewFun 3D Show is as easy to use as it is interactive, and is now available for an ESP of $179.99. (1) NVIDIA 3D glasses and NVIDIA 3D Vision Kit not included.